Jhargram: West Bengal chief minister Mamata Banerjee on Saturday gave Maoists a seven-day deadline to lay down arms, saying violence would not be tolerated any more. “I am giving you (Maoists) a seven-day ultimatum to lay down guns. Think over it. We will not tolerate any more violence. Killings and negotiations cannot go hand in hand," she told a rally here. Condemning killings by Maoists and gunning down of two Trinamool Congress (TC) leaders in junglemahal recently, Banerjee said, “We have started the peace process, stopped joint operations for over four months, expecting peace to return... But they (Maoists) have not kept their word and continued the killing spree." She said if peace returned to junglemahal, there would be no need of joint security operations. Asking the Maoists what they wanted, the chief minister said, “Tell me what you want? We will give you schools, colleges, roads, jobs... everything... The door for dialogue is still open. We want a solution through negotiations but we will not tolerate any more violence." Holding up the three-month-old baby of slain TC leader Lalmohan Mahato, Banerjee said, “We do not want any more mothers to lose their children... I will never compromise with peace. Development is another name of peace." Daring Maoists to come into the open instead of indulging in killings under the cover of darkness, she said, “You want to kill Mamata Banerjee? Tell me where you want to kill me. There will be no policemen with me." On Maoist threat to people not to avail of government assistance like rice and foodgrains, she said, “Don’t be afraid of some goondas. We will not allow this to take place anymore... Development can’t come through terrorism." 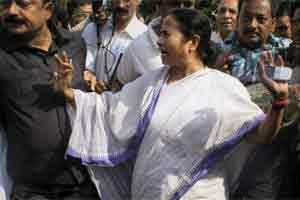 Urging Maoists to return to the mainstream, Banerjee said, “We will give protection to those returning to normal life. We will give them jobs, monthly pension and benefits under other schemes." Announcing a number of development projects for junglemahal, said she if development starts taking place in the region, Maoists will be gradually alienated from the masses.